Do you ever ponder how God can remember you? I have wondered about that at times, but scripture tells me that he is omnipotent, meaning having all power and authority. There is nothing He can’t do. Mere man can dream up computers, space travel and the like. Just imagine what our God can do. It is hard to wrap our little finite minds around what He can do. He is with us always, and hears all of our prayers and loves us all individually. Having said all of this, it’s not hard for me to believe that our face is in His hand much like the cameo’s above. Our face is always before Him. How awesome is that! 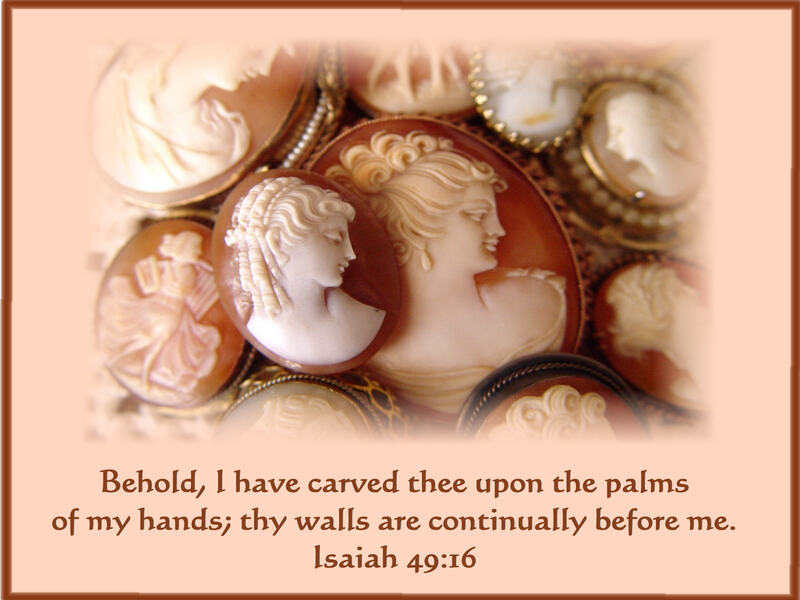 When the Lord made that clear to me I began collecting Cameo’s, it is such a beautiful visual aid for me. He is looking at you right now! He does remember you! Whenever I see a cameo, I think of you still!